Starting in elapsed time keeps the racing continuous so it was race leaders Warren Price and Andrew Hill who set off at pace ahead of their pursuers Damon Stamp and Darren Lill from the overnight at Kob Inn Hotel. Shortly after the start, Hill suffered a puncture allowing Stamp and Lill to slip into the lead. The chase was then on and the pace was intense as the two leading teams made their way through the rest of the field who had started in reverse order, allowing the slower teams to have a time advantage. A head wind picked up during the morning making for testing conditions as the riders made their way through Dwesa Nature Reserve and faced the first big hill of the race, affectionately known as ‘Mother One’. Up ahead, the race leaders forged their way through Rhino Valley and with less than five kilometres to go, Price and Hill had caught up to Stamp and Lill. In the end it was Stamp and Lill who had the edge and took the win in a tight sprint up the final little steep hill off the beach and into The Haven, clocking a time of one hour, fifty-two minutes and 2sec. Bianca Haw and Andrew Houston extended their lead in the mixed category over the veteran pair of Christine and Craig Woods, finishing in third place overall in an impressive time of two hours, twenty-seven minutes and 21sec. 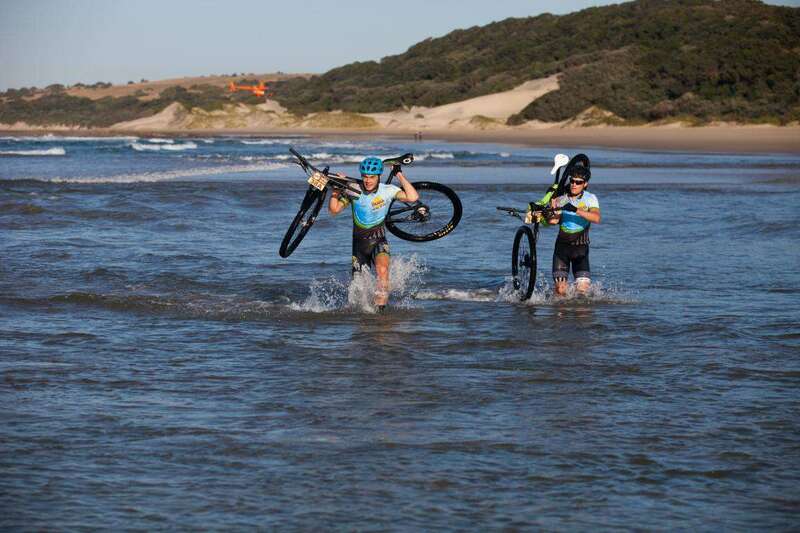 The third stage between The Haven and Coffee Bay covers a distance of about 50km with plenty of testing hills and the magnificient Hole-in-the-Wall feature, which is a highlight of the route. RESULTS: Overall – 1. Damon Stamp & Darren Lill (Wild Ride Supa Soyas) 1h52.02, 2. Warren Price & Andrew Hill (Safire / TIB) 1h53.55, 3. Bianca Haw & Andrew Houston (Beauty & the Skinny Beast) 2h27.21 – 1st Mixed, 4. Craig & Christine Woods (Wildefire) 2h36.31 – 2nd Mixed, 5. David Yapp & Keith Wenke (Beer & Wine) 2h52.38. GC – Overall: 1. Damon Stamp & Darren Lill (Wild Ride Supa Soyas) 3h51.14, 2. Warren Price & Andrew Hill (Safire / TIB) 3h51.16, 3. Bianca Haw & Andrew Houston (Beauty & the Skinny Beast) 4h54.45 – 1st Mixed, 4. Craig & Christine Woods (Wildefire) 5h05.06 – 2nd Mixed, 5. David Yapp & Keith Wenke (Beer & Wine) 5h53.51.